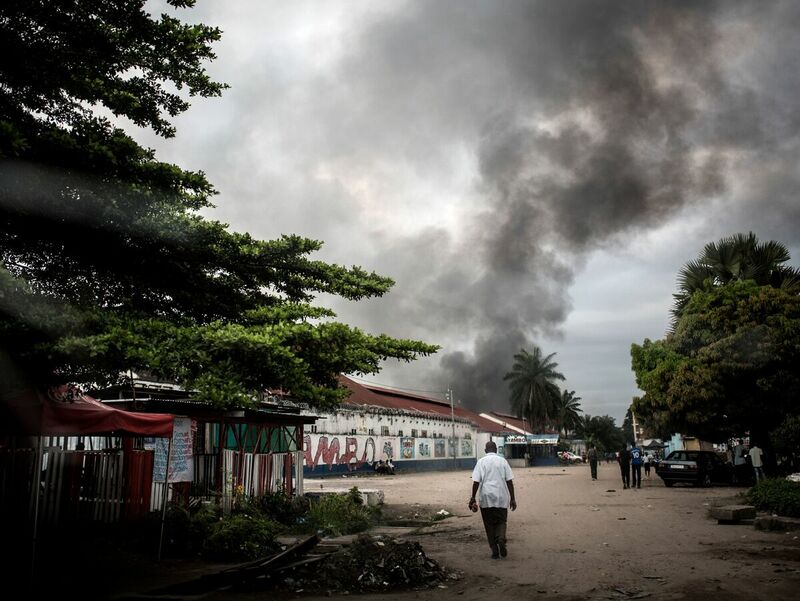 Voting Equipment Goes Up In Flames In Congo's Capital As Election Approaches The blaze destroyed voting machines and booths for 19 of Kinshasa's 24 polling stations. But with 10 days to go, the Democratic Republic of the Congo plans to proceed with its presidential election. A man walks toward the smoke rising from a fire at the Independent National Electoral Commission's warehouse in Kinshasa on Thursday, 10 days ahead of the presidential election. Just 10 days from a momentous presidential election in the Democratic Republic of the Congo, a warehouse fire in the capital has severely complicated the country's preparations. The blaze, which broke out around 2 a.m. local time Thursday, destroyed the voting equipment for 19 of Kinshasa's 24 polling stations. Nearly 80 percent of the capital's voting machines were among the burned materials. In a city of some 13 million people — or over 15 percent of the country's population — the loss has tossed a wrench into the already tense run-up to the Dec. 23 vote. Corneille Nangaa Yobeluo, president of Congo's national electoral commission, said Thursday that the election will nevertheless proceed as planned. In the meantime, his commission has launched a probe to "determine the origin and extent of the damage." Officials were quick to declare that the fire was likely a criminal act, however. "The enemies of democracy have stepped it up a gear," said Barnabé Kikaya Bin Karubi, chief adviser to President Joseph Kabila, according to The Associated Press. Kabila's name is not on the ballot this year, as the longtime leader is barred from seeking a third consecutive term. He has held power since 2001, when he took office following the assassination of his father, then-President Laurent-Désiré Kabila. The race to succeed him has unfolded in the shadow of Kabila's long tenure in office — made even longer when he postponed elections for two years and violently cracked down on demonstrators who decried the move as a power grab. Now that Kabila is relinquishing the presidency, observers have watched anxiously as his hand-picked candidate, Emmanuel Ramazani Shadary, has jockeyed for position with opposition candidates Martin Fayulu and Felix Tshisekedi. The Democratic Republic of the Congo has a dubious record when it comes to elections, with the past two votes marred by violence and not one peaceful transfer of power since gaining its independence from Belgium in 1960. For weeks, the country had largely avoided political violence — until last week, when clashes between opposition demonstrators and security forces turned deadly. In recent days, violence has been reported in several major cities, including Kalemie, Kindu and Lubumbashi. A spokesperson for the special representative of the United Nations secretary-general released a statement Wednesday deploring the bloodshed and calling on authorities to "secure the electoral process, and to exercise restraint and neutrality in the use of force." At the same time, the country remains in the grip of an Ebola outbreak that, as of Wednesday, had killed nearly 300 people. At more than 500 total confirmed and probable cases, the outbreak is the largest in the country's history and continues to spread. Still, Kabila is optimistic the election will run smoothly this week. "I've always wanted these elections to be perfect elections. And I don't use that word lightly," the president told NPR's Ofeibea Quist-Arcton in a rare interview. "We want them to be perfect — meaning before the elections, during the campaign — and especially after the elections when the results are announced."